"Gina Linko has the touch. Indigo is a compelling mixture of vulnerability and mysticism with a lush romantic core. Readers will connect with Corrine's emotional journey and relish the magnetic scenes between Corrine and Rennick." When Corrine moves to New Orleans with her family after the death of her young sister, she brings with her a heavy guilt that has her "quarantining" herself so that she won't hurt anyone else. She knows...or thinks she knows...that it was her other-worldly, electrically charged touch that accidentally killed Sophie after her fall. The trouble is that it's not so easy to shut out the world. Corrine's drawn into new friendships, even as a big part of her wants to recoil. New Orleans, a land of mystery and magic, is the perfect setting for Corrine to grapple with the blue lightthe currentthat surges through her at times. Is it a coincidence or is it Corrine's presence that stops her friend Mia-Joy's insulin pump from working? And how she can draw images of people she's never met simply from listening to taped interviews with local senior citizens her mother has been recording ? The unfolding mystery is rich like dark chocolate, wonderfully written with a varied cast of well-drawn characters, both major and minor. I will admit a special fondness for Rennick, who is both full of curiosity about Corrine and full of his own mysteries. The slow-burning romance between the two seamlessly blends Corrine's emotional state with her exploration of her powers. 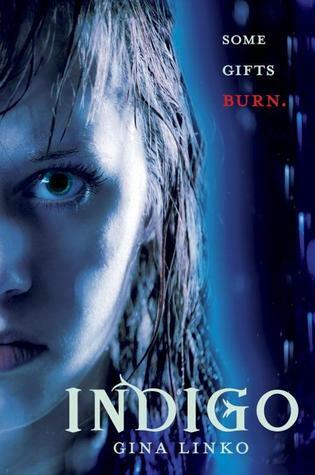 Indigo contains enough realism and depth that it will appeal to readers who aren't ordinarily keen on books with paranormal elements as well as diehard fans of the genre. I'm betting it will win Gina Linko a whole new crowd of readers. You can pick Indigo up in bookstores and from internet retailers today. "You listen to me," he said gruffly, pointing at me. "I'm going to knock on that door and wake up your parents, tell them I found you ready to hop a train, if you don't give me a few minutes here." He looked at me hard, threatening me, although I could see the apology in the shake of his head. But it was what it was. I knew he would knock on the door. I knew he would, so I just gritted my teeth. "Tell me what you know." I met his eyes briefly. The moon was low in the sky, a tiny crescent, a thumbnail, as Sophie used to say. It was an inky night, with very little light, especially in the back of my house, next to the hydrangeas and the electric meter. And, of course, right beneath the window of my parents' bedroom. I listened to the hum of the crickets and toads as Rennick gathered himself. He rubbed his hand across his forehead nervously, and he started to say something twice but stopped himself again. I softened toward him for a second when I realized exactly when he seemed so different from anyone else in New Orleans. It was because he treated me normally. Like people did back in Chicago, back before everything. Easy. Normal. Everyday. Here in New Orleans, I was not a real person. I was a freak, a weirdo. No one treated me like Corrine. I was a story. The sideways glances. The whispers. I deserved it.